This is currently around £619 on the Dell website and £593 on Amazon. Can also get £30 off for new customers who open a credit account. Worked for me and got it for £542.99 with 12 months interest free credit! - Includes an Xbox 360 Wireless Controller with wireless USB adapter. Its also very small at 20cm x 20cm x 5.5cm and weighs only 4lbs. I am aware of the limitations of the machine but its a good deal compared with the prices out there. Just bought it so I can play cheap Steam sale games on it at 1080p. Wow very cool thanks for posting. Although it's £500 ish instead of £200 ish if you're a massive gamer the cheaper games would erode that difference over time. I.e. Mortal Kombat X is sub £10 on PC but sub £30 on console. You would effectively need to buy 15 games with a £20 saving made against console for each one though! Besides that I'm assuming this is far superior in every way to XBone+PS4? That's a mobile/laptop GPU right? That feedback makes it sound a lot better than first impressions. The CPU is about right but the GPU is too weak in my humble opinion. What is this, are we being invaded? Some kind of future tech that we were only able to develop because there is a a small fragment of a cpu from the future locked away in a secret facility. That was 9 years ago, let it go. Its not exactly weak, it can still push newish games at 1080p at 30fps. 30fps is unacceptable unless you game on consoles. this with a barge pole but it's £50 off a pc for a niche role. Whilst you can feel the difference between 30 and 60 fps it's never stopped me enjoying a game either. This is going to be a small, aesthetically pleasing little box to shove under your tv. £550 will get you a much more powerful but cheap and cheerful tower absolutely. This same system is currently £395 (scratch and dent) or £438 (refurb likely without any marks) at Dell's outlet. Don't think the links work so just navigate to Dell outlet > refurbished desktops and you'll find the various Alpha's there. They also have the i7 variant for £491 delivered (scratch and dent). I've bought plenty of machines off Dell Outlet (mostly scratch and dent which are normally without marks or VERY minor with an ever greater saving) and only had to send a couple back. Hope it helps. This same system is currently £395 (scratch and dent) or £438 (refurb l … This same system is currently £395 (scratch and dent) or £438 (refurb likely without any marks) at Dell's outlet.Don't think the links work so just navigate to Dell outlet > refurbished desktops and you'll find the various Alpha's there. They also have the i7 variant for £491 delivered (scratch and dent).I've bought plenty of machines off Dell Outlet (mostly scratch and dent which are normally without marks or VERY minor with an ever greater saving) and only had to send a couple back. Hope it helps. They were even cheaper a few month back, I know because I gave it some serious consideration. 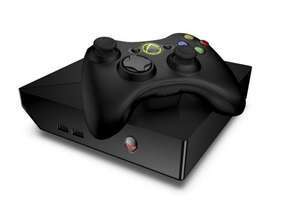 It comes with the Xbox 360 Wireless controller, and it is much smaller than the Xbox One. This PC always seems to get a lot of hate. Was tempted to buy one...now waiting for Zotac's November offerings. Plus this doesn't really feel like a deal on the console since the £30 could apply to anything purchased via Very. I have one, it does not struggle with games,I have Project Cars, Titanfall, Injustice (and many more) and all run better than on my sons Xbox One and his mates PS4. Also the new UI includes Origin and Uplay launchers so you can run prety much all games through the UI now. I think 99.9% of the people who knock it just have not used one or have spent £1-£2K on a PC 3-4 years ago and are now seeing things like this outperform it. It is a perfectly acceptable gaming PC and will run most things at recommended setting, and being a PC can be tweaked to run pretty much everything. I was looking at the new battlefront today and looking at recommended specs it should run on medium to high setting on my i3 with 8gb ram. Chances are it will be running new releases in 3-5 years, just on low-medium settings. But even then not all games require serious pieces of kit run, there are thousands of games that do not need the latest kit to run well. I have one, it does not struggle with games,I have Project Cars, … I have one, it does not struggle with games,I have Project Cars, Titanfall, Injustice (and many more) and all run better than on my sons Xbox One and his mates PS4.Also the new UI includes Origin and Uplay launchers so you can run prety much all games through the UI now.I think 99.9% of the people who knock it just have not used one or have spent £1-£2K on a PC 3-4 years ago and are now seeing things like this outperform it.It is a perfectly acceptable gaming PC and will run most things at recommended setting, and being a PC can be tweaked to run pretty much everything. I was looking at the new battlefront today and looking at recommended specs it should run on medium to high setting on my i3 with 8gb ram.Chances are it will be running new releases in 3-5 years, just on low-medium settings. But even then not all games require serious pieces of kit run, there are thousands of games that do not need the latest kit to run well. I've had it for a while now and its excellent. Exactly what I was looking for and runs everything really well.